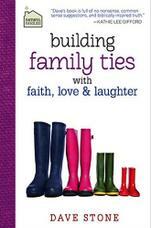 Building Family Ties with Faith, Love, and Laughter is the second of three books in the Faithful Families series where Dave applies his practical, conversational, and humorous approach to the challenge of building strong spiritual ties to each other as a family. Topics include: Contentment, Security, Loyalty, Gratitude, Spontaneity, Communication, and more. Preaching is his gift, but Pastor Dave Stone’s family is his life’s blessing. While raising three kids with his wife, Beth, as well as shepherding the diverse families of his congregation, his heart, and passion for building strong families rings louder than ever. He knows that raising faithful families is a key to the future of the church.